Many claim that the European Union threatens the sovereignty of its member states. However, Europe is still far from a federal system. In any case, a federal Europe would have several advantages. The word federation means alliance. Therefore, a federation is an organization, whose members have a common legal system, share common administrative institutions, and conduct common politics. For member states, to establish the foundation of a European federation would mean to create a common army and a common parliament, and the two would be financed from a common budget. The question is: do Hungarians need to be part of such a federation? My answer is: yes. Before we go any further, it is necessary to mention that the European Union in its current state does not amount to a federation because it does not have a common army nor a common economy. In my opinion, the most important task for a federal Europe would be to ensure that member states can live together peacefully. A common army would serve this goal by taking the responsibility for the security of the European states. This aspect appears to be very important especially nowadays, since terrorism has started infiltrating Europe, and fighting it together would be far easier. It is important to emphasize that the European federation couldn´t exist without a unified economic policy. Many people think that if this were to truly happen, the member states would lose their sovereignty. If a unified European Parliament governed a federal Europe however, then the representatives of all the states would have a decision-making right. This way the sovereignty of the states would remain intact. Europe could only compete with a unified alliance against big powers such as China, Russia, and the USA. The creation of a unified Europe is based on the extension of the Eurozone. It is necessary that the member states which are not part of the Eurozone yet commit themselves to the introduction of the euro. The EU has to establish a bank union without further ado in order to abolish the undesired financial dealings that European banks have carried on with until now and to decrease debts in foreign currency which represent an unresolved burden for many European citizens. The Eurozone has to have its own financial system which can, in turn, contribute to economic stability. Furthermore, it is important to understand that the world we live in today is globalized. Therefore, it is unified entities, such as a European federation, that stand a chance. No matter how much some Western-European leaders push the idea of a federal Europe, most citizens do not agree with that. People have a good reason to oppose federalism. With the withdrawal of the United Kingdom from the EU, the opponents of a federal Europe lose a significant player. Apparently, this fact hasn´t stayed unnoticed by the European elite in support of deeper integration. 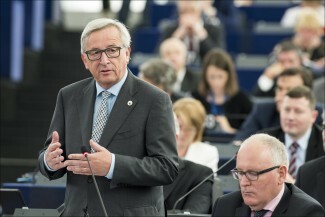 In 2017, Jean-Claude Juncker, the President of the European Commission, held a speech about the future of Europe. Amongst other issues, he explained that in future it would be advisable for all member states to join the Eurozone. He also mentioned that it was necessary to create a “super-presidential” role in the Union. Furthermore, he would also forbid in future that nation states make decisions about so-called strategic investments on their own. He would introduce that all such measures be authorized by the competent organizations of the EU. German Chancellor Angela Merkel has welcomed Macron’s plans for a closer European integration. Macron has offered Germany more intense cooperation, so the outlines of a Union led by a French-German tandem are taking shape. Creating the United Nations of Europe would not only weaken national sovereignty of member states but also result in their dissolution. The plan is a process controlled from above which goes against the will of citizens and the intentions of member states. With regard to their own interests, leading politicians of the Old Continent, force on member states their integration plans, creating in such way a Europe controlled by a central power. In the past three years, a survey was conducted in all 28 member states of the EU, led by the Századvég Foundation (Hungarian think tank). It was carried out in order to examine the opinion of European citizens regarding questions that are most likely to shape the future of Europe. This survey was done on a sample of 1000 randomly selected adults in each country, so in total on 28 000 people, in an unprecedented manner. 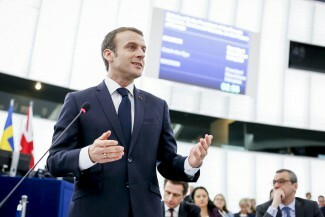 Project 28, as the survey, which was completed in February, was named, evidently supports the claim that federalist plans, such as Macron’s, go against the opinion of EU citizens. The majority of EU member states think that more national sovereignty and less European integration is needed. A federal Europe has no support in society. Therefore, by ignoring this fact and favouring closer cooperation the European leadership goes against the will of the people and tries to subordinate sovereign member states to its own interest in an anti-democratic manner. All over the world, many countries operate successfully as federal states. A perfect example of a federal state is the United States of America, but Switzerland and Germany also operate as federal systems. The point of the federal system is that there is a federal and a member state level: states have competences in certain issues, but in many others, they give up their sovereign right and delegate it to the federal level. In such cases, the relationship between ethnos, a community based on a national identity, and demos, the community constituting the state and politics, is primordial. At the time of the foundation of the United States of America, the ethnos wasn’t of importance – there were no large communities based on national identity – since people were free to immigrate from anywhere and gain citizenship wherever they settled down. In Germany, the federal system was developed on the basis of common culture, language, and historical heritage. In Switzerland – similarly to the EU – national (cantonal/linguistic) identity played an important role. At the same time, there is a Swiss political community, a demos as well. However, is not the case for the EU. At least not yet. The European Union is still in an infancy stage and only materializes through the European Parliamentary elections. A European federation is an erroneous idea and it is unimaginable at the moment. According to the Eurobarometer survey, 54% of Europeans are of the opinion that there is no common European culture since the countries are too different from one another. These results serve also as a proof that there is no unified European people. Europe is culturally too diverse to be united in a federation. During the past few years, Eurosceptic parties have gained popularity in all of Europe. In Italy, Germany, France, Denmark, Finland, and the Czech Republic, Eurosceptic voices appeared or became stronger. They’re criticizing the EU for initiating measures of deeper integration, amongst other things. According to plan, the UK will leave the EU in March 2019. The British said no to participation in the European integration. Czech Prime Minister Andrej Babiš alluded to the fact that forcing closer cooperation could push other countries to follow the lead of the UK. Therefore, the Union’s leadership, waving a banner of the United States of Europe, is treading on thin ice. Excessively close integration plans not supported by a majority rather evoke fear in people, not motivation for closer cooperation.